I have been cooking and catering dinner parties, business luncheons, wedding receptions, and parties for family, friends and clients for over 20 years. I am a graduate of the Culinary Business Academy, a premier member of the United States Personal Chef Association (USPCA), as well as an active member of the Atlanta USPCA chapter. I am ServSafe Certified with a food safety management certificate administered by the National Restaurant Association. I have been featured in an Occastions Magazine article about a Dawsonville Anniversary Party by Kelly Lane Photography. I prepared a special 5 course prime rib meal for the couple's 40th anniversary dinner. For a few years I was invited to be a judge at the Flavors of Forysyth. This culinary and music festival features Forsyth County’s finest restaurants, children’s activities, live music, giveaways, and a culinary competition judged by local industry experts. For a few years I cheffed at the Masters Golf Tournament in Augusta at one of the corporate homes. I have provided a five star dining experience for the senior managment of these fortune 500 corporations and their guests. In 2007, my service was featured in the "Ways to Say I Love You" AJC article which was done in time for Valentine's Day. 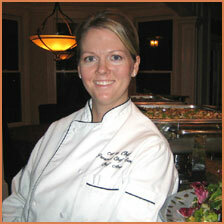 I have taught classes at the USPCA National Conference in Atlanta on Catering and Dinner Parties. Please contact me by phone or email if you have questions or want further information. In 2012 my husband and I founded a non-profit called Just One Africa. Just One Africa cares for orphans and vulnerable children in Kenya by providing access to clean water and by partnering with local leaders to provide sustainable solutions which create hope through care, education, and community development. We also provide clean water to people in need, through the use of filters. Please "like" us on Facebook.